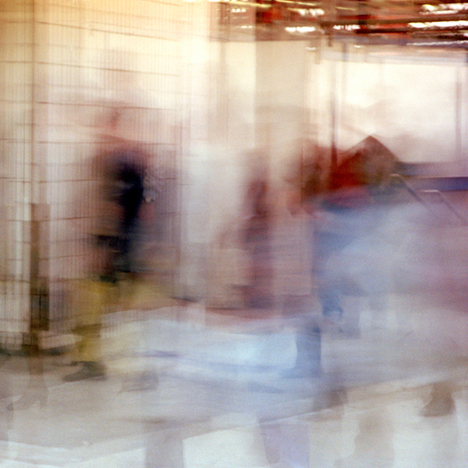 Surges of movement, the flickering speed and the chaos of Rush Hour crowds can cause anxiety for many, but for Mark Willcox it can often be overwhelming. This body of work is an attempt to recreate the disorientation he sometimes experiences, with an unusual sight impairment, in the maelstrom of busy cityscapes. His approach is rooted in concepts that are inherent in Chaos Theory. Works in the Rush Hour series interpret passages of time and are unique in that they could never again be recreated at the scene of their origin. His creative process does not follow an accepted notion of what photography is, but explores transformational qualities that can be achieved in the photographic capture of light, to create something from everyday circumstances that can be felt or experienced but not necessarily seen. This process could be described as a visual alchemy derived from transitory, fleeting events. The Rush Hour series was exhibited to great critical acclaim during the Independents Liverpool Biennial in 2008 - Liverpool's year as European Capital of Culture. Ten works from the Rush Hour series were acquired by the University of Salford for its permanent collection, which also includes works by L S Lowry. All content in this website is the copyright of Mark Willcox �2019. It is illegal to copy or change any content without consent.